Retractable banner stands are probably the most popular style of banner stands due to the ease of storage of the banner as well as the quick set up of the product. 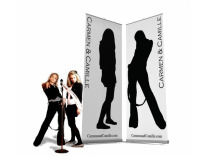 With retractable banner stands, the banner retracts back into the base of the product with the aid of a spring mechanism that scrolls the banner until it’s safely stored inside the base unit. There are a variety of retractable banner stand base units available, and the difference in base units along with the different types of graphic printing processes, are the main differentiating points with retractable banner stands. A Big 64" wide Graphic! Change Your Graphic on the Fly! Retractable banner stands such as the Quickscreen and MediaScreen are considered at the top of the list due to a more stylish base while some have a rotating foot that swivels out at 90 degrees from the base to provide stability and others don’t. The Pronto retractable banner stand is considered as a middle of the road banner stand which has all the features of the more expensive banner stands but at a mid level price. There are also a host of very low end retractable banner stands in the market due to the economy features of the base unit they use. 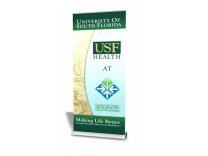 Retractable banner stands come with options such as removable graphic cassetts, color of base unit, varying banner height options, and even a 10 foot tall retractable banner stand. Probably one of the most impressive retractable banner stand is the outdoor banner stand made by Optima Graphics. It has a flexible mast and will lean away from the wind during turbulent weather. 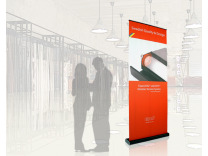 Another feature of retractable banner stands of late are the double graphic possibilities. In many trade show display venues or even in public malls, traffic comes both ways, and with the double banner retractable banner stands, you've got your message out there catching traffic from multiple directions. One other interesting retractable banner stand is the 10 foot tall banner stand. This giant of a graphic is stored in a matt-silver chome base and comes with Optima's famous kaleidoscope Select printing with diamond finish. 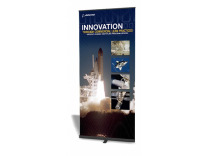 Hard shell shipping cases are available with this and all other retractable banner stands. Economy retractable banner stands are almost exclusivery printed on super flat vinyl verses high quality fabric, and most vendors of the economy retractable banner stands, have tighter turn around times which cater to the lower end of the retractable banner stand market. One of the major suppliers of trade show exhibit graphic products is Optima Graphics in Fenton, Missouri; whose history is providing services and products in a very distinctive way. How are they different from the rest of their competition? They totally comprehend the big business picture which is to focus on the long range success of the business relationship with their customers, while at the same time focusing on the immediate challenges of the day to day delivery of products and services. Their vision is to be the clear choice as far as vendors in the marketplace by executing these strategic goals in concert. They have an capability to consistently deliver above and beyond through great planning, providing information on present issues, and a consistent flow of new products for the future. Years ago, it was Optimas' bold move into the Lambda printing technology which is used in photo murals for pop up displays, that really got everyone's attention in the display industry. Their new products in the pop up displays arena have been extremely innovative, well received in the marketplace, and giant sellers with all their distributors. Optima continues to shine above all others in graphic production for the trade show market. One of the leading online retailers of trade show displays, ShopForExhibits., continues to expand what they make available to their U.S. clientele, through their display rentals program which was begun only two short years ago, and the new tension fabric products. To keep pace with the business activity they project in the future, ShopForExhibits.com has just gone live with an entirely new web site which delivers prospective clients with an elevated level of product support along with product videos and graphic templates. Although the future is anything but certain in this place in time, great new products and reasonable pricing will be most important in order to navigate the challenges ahead. Successfully bringing new products to market such as the new tension fabric displays, isn't as simple as one would think, but due to the years of experience with display products and online marketing, ShopForExhibits.com has positioned themselves to lead the pack and be a successful competitor in this industry.